We are coming up on the first anniversary of the release of Pray For Japan. As such, we have a lot to be proud of, and even more importantly, a lot of people to thank. Even a documentary made with a zero budget, with so many volunteers and so many great companies donating their services, incurs some expenses. It took until December of 2012 to where we were finally “even” on those expenses. Now that we finally ARE even, we can begin to take money going forward and actually plow it into donating to Non Profit Organizations on the ground in Tohoku. Many of them have been there from nearly the beginning of the crisis, and remain because the need is still very present. Right now, you can buy Pray For Japan on DVD and Blu-Ray through our partners at RightStuf.Com, and you can rent or buy the movie through Amazon Instant Video, iTunes, and YouTube. We were able to do our theatrical release in March, 2012 thanks to three very awesome exhibitor partners who donated their services: AMC Theatres, Hollywood Theaters, and Cinem@rt Japan. We are continuing to make Pray For Japan available for US theatrical showings through Tugg, a service where you request the screening in your home town and then presell tickets to family, friends and colleagues through the Tugg website. We also have a host-a-screening program for institutional and small group showings of the film. The most important thing is that we are keeping awareness alive of the fact that the Tohoku story is not over, that the areas affected by the Great East Japan Earthquake and Tsunami will continue to need the help of the world to recover from one of the most devastating natural disasters on record. 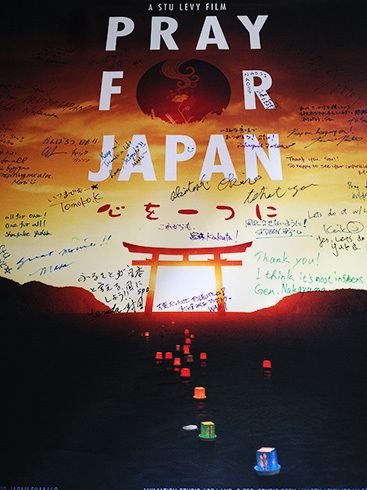 In commemoration of the 5th anniversary of Tohoku Disaster: Pray For Japan has been set free! Pray For Japan now available on YouTube, and three Japanese sites, for rental! We’re an Official Selection of the Fourth Viewster Online Film Festival!